The Nokia X range has certainly set tongues wagging, boasting an Android OS in place of that now-familiar Windows Phone we've become accustomed to. 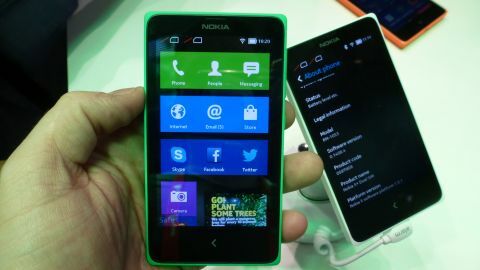 The Nokia X, Nokia X+ and and Nokia XL all arrived at Mobile World Congress 2014, with the former coming in at just €89 (around £73/$100) and the latter boosting screen size to 5 inches for €20 euros more. Which, of course, leaves the awkward middle child - priced smack bang in the middle of its two brothers and offering a little more RAM and the smaller screen size. The assumption is that this range is aimed at developing nations - you won't see both the X and the X+ because, frankly, the difference is so minor it took Nokia a good five minutes to identify a Plus for us to get our hands on. So let's start with centrepiece of this hunk of colourful plastic: the modified Android operating system and its bright and breezy tiles. This is, as you will no doubt have noticed, quite reminiscent of Nokia's Windows Phone offering - but that's no bad thing, bringing the patina of Android respectability and an air of Nokia's owner Microsoft to boot. There are issues with the approach, of course, with the Nokia Android Store hugely limited and the option for local apps stores - of which Nokia has sealed plenty of partnerships across the globe - are not quite as polished as the typical Google-fied Play experience. But the experience is largely a pleasurable one - more solid feeling than the interesting Firefox OS and certainly bright and cheerful in the way you would expect a Nokia phone to feel. That cheeriness is helped by a surprisingly nice 4-inch WVGA screen - deep blacks, vibrant color and multi-touch which felt responsive and immediate. It's more of a babushka than a supermodel in looks and size - chunky and solid looking with the curved corners not really diminishing the feeling that you are holding a big Lego brick. But that very solidity brings a sense of robustness, and the plastic finish is pleasing in the hand - as long as you're prepared for the ungainly size. The phone also boasts a dual-sim feature that is certainly a big bonus for a phone that is looking to conquer the developing nations. The dual-core processor is, well, okay. It stuttered a little when we really pushed it - but for everyday usage it coped admirably with only the occasional delay in proceedings. When put up against some of its low cost peers, the X+ is a shining example that bargain should not necessarily mean a horrible experience. Ten extra Euros on the price buys you 768MB of RAM - an extra third on the X's 512MB and we'd suggest that in developing nations there might well be the feeling that the added cost is not worth the performance difference. In isolation, the X+ is a perfectly palatable hunk of plastic boasting a surprisingly nice screen a perfectly acceptable performance level for the price point - and an interesting Android experience. It's not perfect, performance is not the speediest and the non-Google app experience is not an ideal solution, but despite its bulk it's not an unpleasant device to hold or use, especially at its low price. And that means that the X-range has the potential to be a very big deal for Nokia in the markets it is targeting.